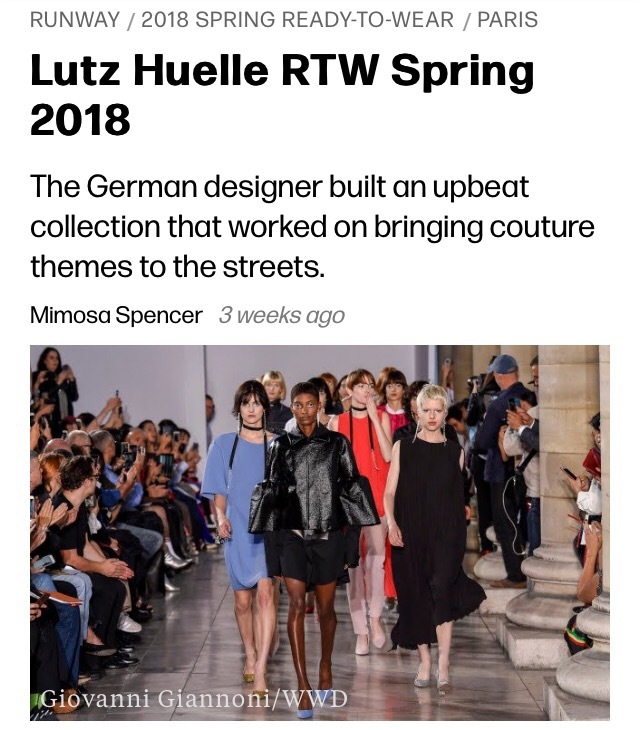 Lutz Huelle doubled down on his quest to introduce more practicality into his collection.For spring, the Paris-based German designer approached the task with earnest, pushing a puffy sleeve down to the elbow of a cropped jacket and lengthening a denim coat by adding lace panels. Underneath the technical details — the nipping and the tucking — emerged a collection that was both respectful and seductive. A button-up shirt became a tunic, with strip of black mesh that covered the shoulders and ran down the arms. A pair of jeans with large squares snipped out of the front panel retained their essence. Huelle ratcheted it up a notch on the elegance scale, pairing the jeans with a long, black tunic and purple heels. “Jeans for very hot days!” read the official description. One of the collection’s loftier fabrics, pleated polyester printed with silver, spiraled around the body to form a column-shaped dress. Thrown over a pair of periwinkle trousers, it became more relaxed. Backstage, talk centered on the surgical details of his design process before veering into political topics such as Brexit. “You can’t close your eyes, you have to be active and positive,” Huelle said. “There’s a light,” read his T-shirt, which he wore over a pair of white jeans.